The Toyota Avanza is an Indonesian designed mini MPV produced in Indonesia and also assembled in Malaysia, with supervision from Toyota, who also sell the car under their Daihatsu brand. The car was launched at the Gaikindo Auto Expo in 2003 and sold over 100,000 units that year. The name “Avanza” was taken from the Italian word avanzato, which means “advance”. 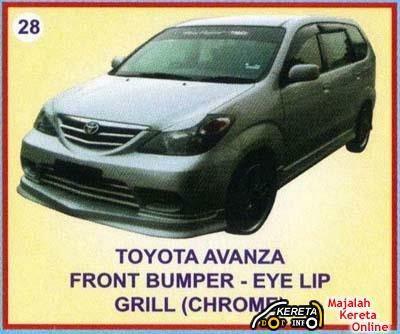 The Avanza is a new model develop as low premier MPV to split Toyota Kijang/Toyota Unser to 2 different models, another new model is the Toyota Innova which is higher spec and aimed at a higher market. Toyota Avanza is sold in Indonesia, Lebanon, Bangladesh, Malaysia, Thailand, Philippines, South Africa and Mexico. HYUNDAI I10 NOW WITH 1.25-LITRE KAPPA ENGINE. I am looking for front and back kangaroo bar for my Avanza 1.5E year 2013. Can you supply and install? Di mana saya boleh dapatkan rear lamp reflector of avanza model 2008 1.5s?..